Like our other migratory skippers -- Sachem, Ocola Skipper and Long-tailed Skipper -- Fiery Skipper typically arrives toward the middle or end of the summer season. It may become a temporary colonist, perhaps raising a brood, but it does not persist here owing to lack of cold tolerance. It cannot survive the winter. Fiery Skipper was not known in New England in the 19th century, and Scudder, referring to specimens from New York and New Jersey, wrote “The two last localities render it probable that it will be discovered somewhat further north along the sea coast...” (1889: 1633). Scudder's prediction was quickly proved correct: several Fiery Skippers were found August 20-28, 1911, in Providence, Rhode Island (Farquhar 1934). The first Massachusetts record appears to have been 2 October 1940, at Westport, collected by W. P. Rogers. The second record came with the discovery, right after the Atlas period, of 5 males and 1 female at Rockport (Essex Co.), September 8, 1991, by C. Leahy. These were at the back of Waring Field, a hotspot for late season migrants; they lingered there in a patch of flowering peppermint at least through September 12 (Cassie, MAS Atlas). This find brought Fiery Skippers into the limelight for this state, sparking annual MBC fall trips to Waring Field for the next few years in search of Fierys. The trips were usually successful. Fiery Skipper is a common southeastern coastal plain species which regularly each summer colonizes a broad band to its north (maps: Cech 2005; Opler and Krizek 1984; BAMONA 2010; it is also found in southwestern United States). Thus Fiery Skipper is a temporary late-season immigrant in southern New England, west through Pennsylvania, southern Wisconsin, and the plains states. It often reaches southern Ontario, sometimes in good numbers, and mating has been observed there (Layberry 1998). 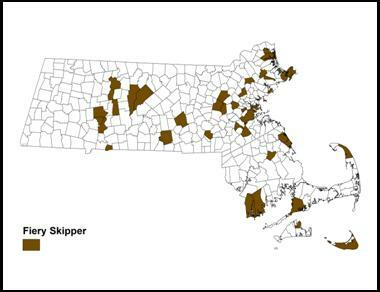 In the latest strong surge northward, in 2012, Fiery Skippers were found in numbers in both Vermont and southern New Hampshire (see photo above). Like the Sachem, the Fiery Skipper uses a wide variety of grasses, but mostly common lawn and weed species such as Kentucky Blue Grass (Poa pratensis), bentgrasses (Agrostis, spp. ), and Crabgrass (Digitaria). In the south it uses Bermuda grass (Cynodon dactylon) and St. Augustine grass (Stenotaphrum secundatum) (Opler and Krizek 1984). It is even considered a lawn pest in parts of its range. Cech (2005) points out that the larval leaf nests lie horizontally in the sod, where they can survive mowings. Also like the Sachem, the Fiery can be found in a wide range of open, sunny habitats, such as fields, pastures, lawns, gardens, roadsides, weed patches, and shrubby areas. It uses a great variety of nectar sources. Some authors write that the Fiery is especially attracted to human-altered habitats. Chart 88 shows that Fiery Skipper has been seen in Massachusetts nearly every year 1991 through 2013 (none seen in 1992 or 1994), and that the numbers seen have fluctuated, but rose markedly in influx years 1999, 2002, 2007 and 2008. In 1995 there was a massive flight of this species just to the south of New England, but that did not seem to have a great impact here. Chart 88 also shows a trend toward increase in the number of Fiery Skippers seen over the years 1991-2013. This impression is borne out by a separate list-length analysis of MBC data 1992-2010, which found a striking 259.8% increase in detectibility of Fiery Skipper over these years (Breed et. al 2012). The year 2011 saw another strong increase in Fiery Skippers, with 66 different individuals reported (taking the high count for each site). But the greatest influx by far came in 2012, when an astounding 279 individual Fiery Skippers were reported (in 114 different reports), and 27 new towns added to the known sighting locations in the state. Of our four late-season in-migrant skippers -- Sachem, Fiery, Ocola, and Long-tailed Skippers-- the Fiery has been seen with the greatest regularity and in the highest numbers. It was reported in 21 of the 23 years 1991-2013, and every year since 1995. The Atlas had called this species a “vagrant,” but the term no longer captures the regularity of its occurrence. Regular migrant is now more accurate. Parallel sightings increases have occurred in the cases of Ocola Skipper, which has been seen in 13 of these 23 years, Long-tailed Skipper, seen in 16 of the 23 years, and Sachem, seen in 15 of these years. For all these migratory skippers, there are essentially no historical records, and then a burst of sightings beginning in the 1990s, that is, within the last 20 years. The Breed study found a 691% increase in Sachem, and a 250% increase in Ocola Skipper as well as the 260% increase in Fiery Skipper, although no significant increase in Long-tailed Skipper. Of these increasing southern immigrant skippers, Sachem is probably the most likely to survive a warm winter here. MBC sightings 2000-2007 ranked Fiery Skipper as “Uncommon,” about on a par with Zabulon Skipper and Pepper and Salt Skipper (Table 5). In 1991, the only known occurrence of Fiery Skipper was in Rockport, MA. Eighteen years later, the number of locations where Fiery Skipper had been found increased enormously, to 37 towns through 2009 (Map 88a). By 2000, sightings in New Salem and Petersham had demonstrated that Fiery Skipper could reach the north central part of the state. But through 2009, Fiery Skipper had not yet been reported from Berkshire County or from anywhere west of the Connecticut River valley (Map 88a). The most likely locations were, and still are, either along the coast (Cape Cod, Martha’s Vineyard, Nantucket, Cape Ann, Nahant), or the Connecticut River valley. In the three years 2010 through 2012, 33 more new towns were added, for a total of 70 towns in which there had been at least one sighting of Fiery Skipper (Map 88b). In 2012 alone, the year of the big influx, 27 new towns were added. In 2011 there was a report from Sheffield (1, 7/30/2011, Bartholemew’s Cobble, T. Gagnon and F. Model) and in 2012 one from Lenox (1, 8/23/2012, B. Weber, NABA Sightings page); these were the first reports ever from Berkshire County. 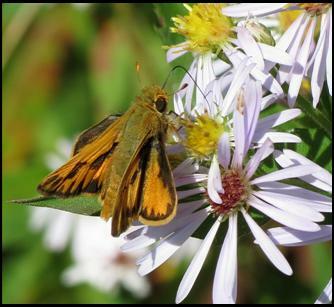 In 2012, Fiery Skipper made it as far north as Grand Isle, Vermont, in Lake Champlain, and was also found in southern Vermont and southern New Hampshire. In years of larger flights north, Fiery Skipper is more likely to turn up further north, and at higher elevations. 2013 was a poor flight year, and only one new Massachusetts location, Grafton, was added. Amherst 4 males 10/2/2005 F. Model; Boston Roxbury Millenium Park 1 report; Concord Nine Acre Corner 3 reports; Dartmouth 4 reports; Dover Elm Bank 14 on 9/25/2012, B. Bowker; Falmouth 2 reports; Gloucester Eastern Point 2 reports; Gloucester Wolf Hill Garden Center, 5 on 8/22/2012, R. Heil; Longmeadow Fannie Stebbins WS 2 reports; Marblehead Haley yard 4 reports; Marshfield Daniel Webster WS, reports in 1999, 2000, 2001 , max 17 on 8/3/2012, D. Furbish; Nantucket Tuckernuck 1 on 10/9/2006 S. Perkins; Newbury Stichter yard 2 reports; Newbury Old Town Hill 6 on 8/18/2012, M. Arey; Newburyport Plum Island, max 6 on 10/6/2007 E. Baldwin; Northampton community gardens, reports nearly every year; Plymouth White Horse Beach, 13 on 9/24/2012 M. Faherty; Raynham Borden Colony, 5 on 10/5/2012 J. Dwelly; Rockport Waring Field, reports in 1991, 1995, 2000, 2001, 2003, 2005, recent max 6 on 9/21/2002 MBC members; Topsfield IRWS, reports in 1999, 2004, 2007; Waltham community gardens max 3 on 9/17/2008 2 m,1f, J. Forbes; Wayland community gardens, max 6 on 10/5/2002 5m,1f, S. Moore, B. Volkle and E Nielsen; Westborough Heirloom Harvest, 5 on 9/20/2012, S. Arena; Westport Sylvan Nursery 8 on 6/12/2012 L. Miller-Donnelly. Until 1999 Fiery Skipper had not been reported prior to September in Massachusetts, and it was presumed not to have time to complete a generation before frost. But 1999 saw a sizeable influx (Chart 88), and individual Fierys were seen in July for the first time, at four separate locations: 7/15/1999 Longmeadow M. Fairbrother; 7/15/1999 Petersham D. Small; 7/16/1999 Milford R. Hildreth; and 7/18/1999 Marshfield M. Polana. This arrival timing would allow for completion of a brood, and indeed that year, many sightings and individuals were seen at nine different locations throughout September and into October, the largest being 16 counted on Cape Ann on 9/19/1999 D. Savich and C. Tibbits. It is also quite likely that a brood was raised at Northampton community gardens in 2007. That year there were July and mid-August sightings at the gardens, and then many sightings of both males and females there again in September through early October. The high count was 5 on 9/27/2007, 4 males and 1 female, seen by T. Gagnon. There have been July sightings in 8 of the 15 years 1999-2013. Earliest sightings: In the 23 years of BOM-MBC records 1991-2013, the five earliest "first sighting" dates are 6/30/2012 Plymouth, M. Faherty; 7/12/2000 Wenham Canal, F. Goodwin; 7/15/1999 Longmeadow, M. Fairbrother; 7/22/2007 Northampton D. Case et al., and 7/23/2010, Edgartown, M. Arey. The effect of the particularly warm springs of 2012 and 2010 is evident. Latest sightings: In the same 23 years, the five latest "last sighting" dates are 10/26/2012 Brookline, B. Cassie; 10/25/1995 Sudbury T. Dodd; 10/24/2000 Sunderland D. Case; 10/21/2007 Newbury S. Stichter; and 10/20/1997 Worcester Broad Meadow Brook WS J. Mullen. Peak numbers are usually seen in late September and early October. There is no doubt that sightings of Fiery Skipper have increased in Massachusetts since Scudder’s day, and they will undoubtedly increase even more as climate warms (Table 6). Fiery is a rapid and active flier, and is multi-brooded, usually having two to five broods. Given the skipper's mobility, adaptability, multiple broods, and use of common lawn grasses as host plants, populations to our south may well increase, allowing for more dispersing individuals to arrive here in late summer.